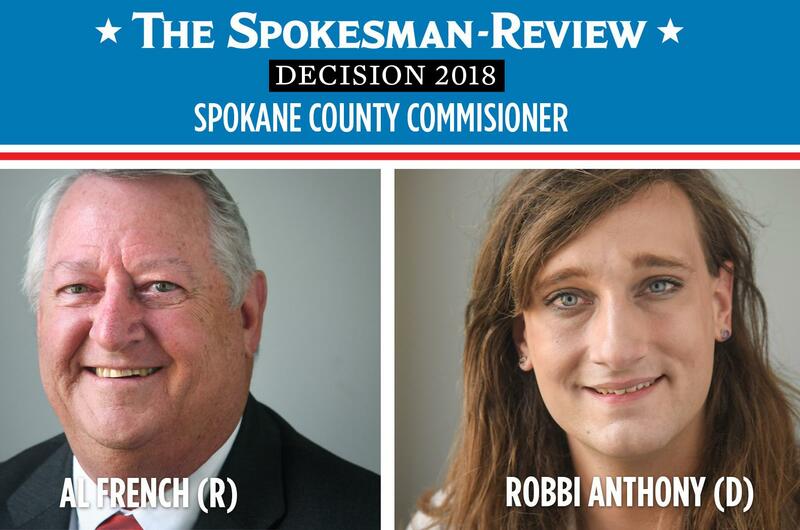 Republican Al French will have a third term on the Spokane County Commission. French defeated Democratic opponent Robbi Katherine Anthony to retain his seat securing 56 percent of initial votes tallied in Tuesday’s election. Anthony garnered 43 percent. French, who has served two terms on the board, ran on a platform of continuing reform on the county’s criminal justice system and furthering economic development. He counts efforts in attracting the proposed Amazon fulfillment center to the West Plains as a major accomplishment. The two candidates disagreed on approaches to balancing the county’s budget and state legislation expanding the board from three to five commissioners in 2022. Anthony, whose campaign slogan was “elect different,” took a pledge to accept campaign donations only from individuals and said she would aim to bring diversity to the county. Anthony secured 54 percent of voter support in the Democratic-leaning District 3 over French in the August primary election. However, the county leans Republican as a whole, and French was able to pick up more votes in the general election. Published: Nov. 6, 2018, 9:27 p.m. Updated: Nov. 7, 2018, 8:49 a.m.